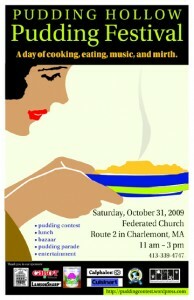 My neighbor Mary Kay Hoffman likes to organize a “canning camp” in the late summer for her children and grandchildren. Putting food by with her offspring helps her manage the output of her vast garden and store food for the coming winter. It also enables her to pass along useful skills. 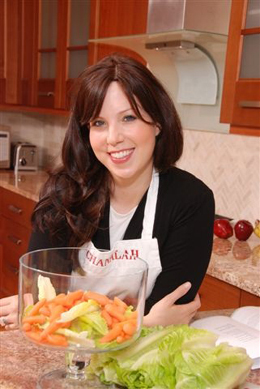 A few years ago it seemed as though the art of home food preservation was dying. With most fruits and vegetables available year round in grocery stores (albeit not in super-fresh form) not everyone saw the need to can, freeze, dry, or prepare a root cellar at this time of year. 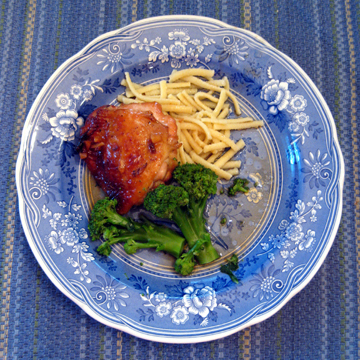 As a result, fewer and fewer people had the basic skills needed to put food by. Now two factors are reversing this trend. First, Americans’ increasing interest in living sustainably makes growing (or locally buying) one’s own food more appealing. This is particularly true here in New England. In Florida, Texas, or California local produce is available year round. Here we know the snow drifts will cover gardens and farms within a few months. Second, the poor economy has helped drive up the sales of canning jars and other home-preserving paraphernalia. Since labor is donated home preserved food is often more affordable than its store-bought competition. 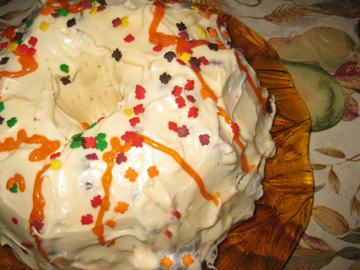 It is also given a boost by the fact that one knows exactly what ingredients went into it–and that it is generally made with love. Not everyone knows how to put food by, of course, even in the country where I live. One organization here in the hilltowns of western Massachusetts recently took it upon itself to help local cooks gain preserving skills by running a public canning camp. Share the Warmth is an Ashfield group that grew out of last year’s oil crisis. Through it town residents have helped their neighbors stay warm in a number of ways. They have aided individuals in performing basic home weatherization. Last year members rounded up winter coats for those who needed them–and organized a shelter during the ice storm that devastated much of New England in December. Share the Warmth has also created a woodpile for people who run out of wood, and its members are planning a community garden for next year. 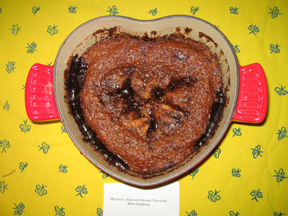 Its most recent project was led by Mary Link, a notable canner. Mary has now organized two canning workshops to help her neighbors share summer’s sunshine all year round. She taught neighbors to make strawberry jam in early July. 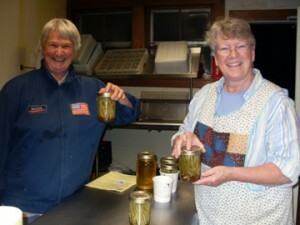 Her second canning camp, which helped participants put up dilly beans, took place in early September. Dilly bean ingredients await canning. Mary Link has many skills in addition to canning. 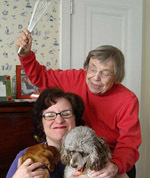 She works as an administrator in the Greenfield school system and also teaches textile arts in the high school there. “I’m involved with the Ashfield Community Theater, I sing in Greenfield Harmony, I keep track of my wonderful 13-year-old daughter, and I swim across the lake,” she told me. Clearly, canning is an important part of that busy life. 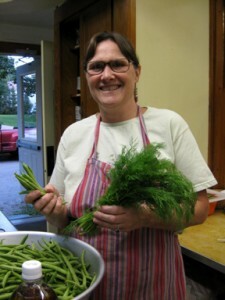 I watched Mary set up for the dilly-bean workshop and was impressed with her cheerfulness and competent demeanor. When it was over I asked her how she felt about both workshops. She replied happily that she had run into a number of participants from the first workshop who boasted of their newfound success in home canning. “It’s one of those things you feel more comfortable about if you see it done than reading about it in a book,” she explained. She hopes the program will expand next year. 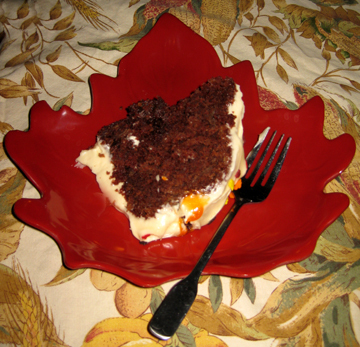 Meanwhile, she has shared her recipe with my readers. Mary went into great detail about the process of sterilizing and processing jars. 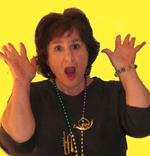 For that information, I refer readers to a couple of great web sites. 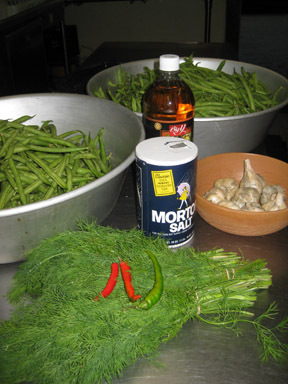 The United States Department of Agriculture offers a PDF version of its home-canning guide. The University of Georgia also offers helpful facts and publications for the home canner. Mary Link gets ready to make dilly beans. Mary Link is the expert here so I’m simply reprinting the recipe she handed to participants at her workshop (and very kindly shared with me). The “I” here is therefore not Tinky but Mary. I appreciate her thoroughness in including equipment as well as ingredients in her list of necessities for canning. I made a batch of these myself, and I can’t wait to try them in a few weeks! 7 to 8 pint canning jars and lids (I use the wide mouth–easier to get beans into and out of). They come with lids if you buy them new. A canner can hold 7 jars. Sterilize the jars. While they are boiling, mix and start heating the brine ingredients in their pot. Do not boil for long to avoid water loss. Prepare the garlic (also while waiting for the water to boil, or you can do it ahead). Remove the skins from 14 to 20 cloves of garlic. Cut the cloves in half or in three so you have big chunks. Prepare the dill. Rinse and separate the dill sprigs, remove any bad bits. Pack the jars. Once the jars are sterilized, first pour mustard seeds in so that they barely cover the bottom of the jar (there will be more on the sides and less or none in the center as it is higher). Then throw in about 4 to 5 pieces of the garlic; then a sprig or two of the fresh dill (dividing the total among the 7 jars). Add any other vegetables you are using. Then start filling the jar with the beans. It helps to tilt the jar to the side. Pack the beans in as tightly as you can easily, using the longer beans first and filling in the spaces at the top with shorter pieces at the end. I like to add another sprig of dill on the top at the end, pressed down into the beans so that it will get covered by the brine. Pack all the jars before adding the brine. Pour boiling brine over the beans in the jars. I use a measuring cup to make the pouring easy. Fill to about 1/2 inch of the top of the jar. 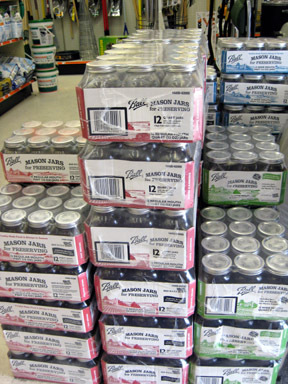 Leaving the air space at the top is necessary for the canning process. Cover the jars with the two-piece jar lids as you go along. Screw the bands tightly (finger tight). Place the jars on the elevated rack in the canner. Lower the rack into the canner. Water must cover jars by 1 to 2 inches; add boiling water if needed. Cover the pot. Bring the water just to a boil. This will take a while because the raw beans will have reduced the temperature of the boiled brine. Once the water boils, turn it off. You do not want the beans to cook. Remove the jars from the hot water and place them upright on a towel to cool completely. It is best to let the jars stand at room temperature 24 hours before moving them. Then –this is the hardest part–you need to let the beans pickle for about 6 weeks before eating. I put a note on my calendar and by the beans to remind me when they will be ready. Store unopened jars in a cool, dry, dark place for up to 1 year. Refrigerate opened jars– if there are any beans left once you open them. In my house they get gobbled up fast! The mixing room at Bart’s Homemade Ice Cream in Greenfield, Massachusetts, isn’t large–just spacious enough for machinery and a few people. Three of them were manning the machines on September 10. All eyes were on “Little Tommy Snow,” the silver-and-blue cylinder that mixes the ice cream for both Bart’s and Snow’s ice cream. On this special day Tommy was blending a new flavor. Into the creamy basic ice-cream formula “he” was whipping air and an orangey-yellow mixture made with peaches from Apex Orchards in nearby Shelburne. The other people in the room were Barbara Fingold and Gary Schaefer, the mom-and-pop owners of Bart’s and Snow’s ice cream; their Flavor Maven, Bob Jaros of Shelburne; and yours truly, a longtime fan of both ice cream and peaches (with the hips to prove it!). 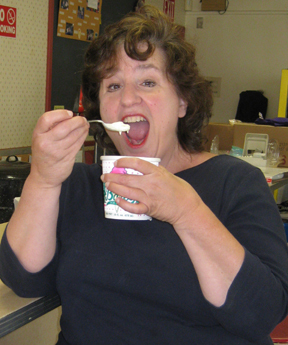 All eagerly awaited the first taste of Bart’s new CISA Local Peach Ice Cream. 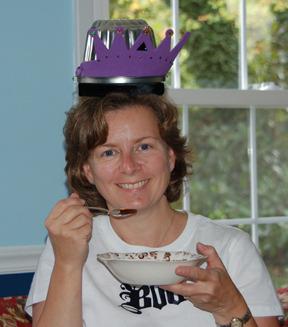 Barbara is the president of Bart’s so it was only fitting that she was given the first creamy spoonful. 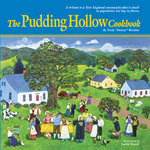 As she sampled the still soft custard she widened her eyes and then smiled. Gary, Bob, and I tasted the next cups. The judges’ unanimous verdict came swiftly: the new flavor was peachy keen. The ice cream’s intense peach flavor hits the tongue right away. The little chunks of peach distributed throughout complement the custard–and reinforce the taste of peaches and cream in every mouthful. After our initial tasting we repaired to Gary’s office with a pint of ice cream. There we discussed the genesis of Bart’s latest product as we noshed. Barbara and Gary explained that both the peach ice cream and the CISA Berry Local Blueberry Ice Cream that debuted this summer stemmed from Gary’s involvement in the board of CISA, Community Involved in Sustaining Agriculture. Gary celebrated the peach ice cream as “a collaborative community event.” The peaches came from Apex. The Franklin County Community Development Corporation food processing center blanched, skinned, pitted, and pureed the peaches. 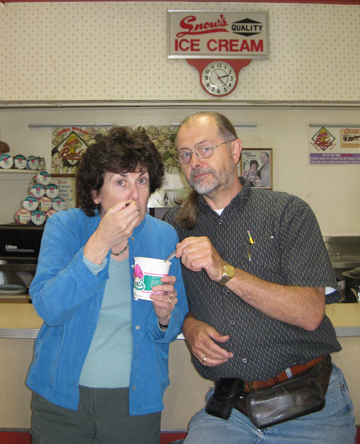 Barbara and Gary try some peach ice cream. And of course the ice cream was mixed right in Barbara and Gary’s small factory on School Street. Like Gary and Barbara, he is a firm believer in local production and supports the idea as well as the flavor of the new ice cream. “In essence the whole circle is one that supports the community in local products and local manufacturing,” he said. Gary interrupted Bob to remind him that the milk in Bart’s and Snow’s is not yet completely local: it is processed in a small farming cooperative in New York State. He said that one of his dreams is to establish a local dairy-processing plant. “It’s this winter’s project … along with our roof,” he remarked with a wry smile. 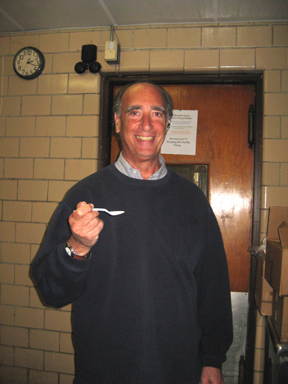 Bob declared that one of the reasons he likes Bart’s and Snow’s ice cream so much is the high quality of the product. “We make it the same way we did 15 years ago, which is not the case with big multinational ice creams,” explained Gary Schaefer. “They’ve all change their formula to make it less expensive. 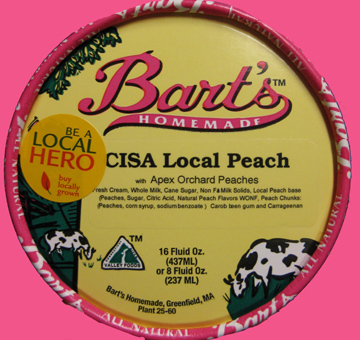 Bart’s CISA Local Peach ice cream is available at local stores now–until this year’s crop runs out! Bart’s lists all the locations that sell Bart’s ice-cream pints on its web site.